I was raised on a farm 5 miles southwest of Irwin, Iowa and graduated in 1975 from Irwin-Kirkman High School. I attended college at Dana in Blair, Nebraska where I earned a BS degree in Art Education in 1979. From 1979-81 I taught K-12 Art at Potter, NE. In the early 80's I substitute taught in the Irwin-Kirkman, Manilla and Harlan school districts. I began teaching K-12 Art in 1984 at the Irwin-Kirkman and Manilla schools. During that time I took classes and earned an endorsement in Reading. I coached Individual Speech Contest students from 1984-2008 which was a lot of fun and I learned so much about Public Speaking and Dramatics. 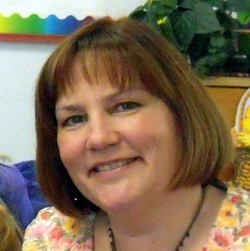 I currently teach Preschool-6th Art at IKM-Manning Comm. School. My husband Gary and I live in Irwin. Gary is a driver for ARGEE Heavy Haulers out of Des Moines. In my free time I enjoy art based activities, knitting, gardening and riding with my husband on our Harley. My dad is the late Hans Nielsen and my mom is Joyce Nielsen of Harlan. My love of art started early. From the time I could hold a crayon I was always drawing or creating. My mom and I spent many hours sewing, cooking and crafting for 4H projects and just for fun, too. Many people on both sides of my family have been artists, teachers, and craftsmen so it is only natural for me to share my enthusiasm and knowledge of art with others. In my classes I try to not only teach the basic fundamentals of art but also my love of art history as well. It's hard for me to pick a favorite type of art activity since I love it all!